1 Preheat oven to 350°. Grease 13 x 9-inch glass baking dish; set aside. 2 In large bowl, combine milks; set aside. 3 In another large bowl, with electric mixer on high speed, beat egg whites, baking soda and salt until soft peaks form. Gradually beat in sugar, egg yolks and Hellmann's® or Best Foods® Real Mayonnaise until blended. With rubber spatula, fold in flour, 1/4 cup at a time, until blended. Pour into prepared dish. 4 Bake 20 minutes or until toothpick inserted in center comes out clean. On wire rack, cool 10 minutes. 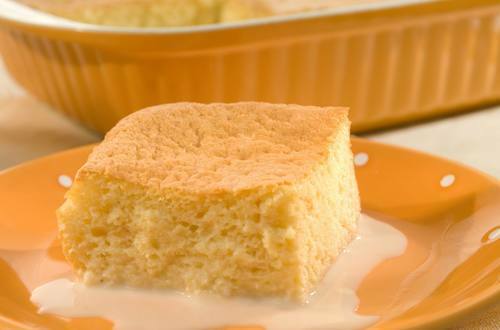 Slowly pour milk mixture evenly over hot cake. Cover and refrigerate at least 4 hours or overnight.